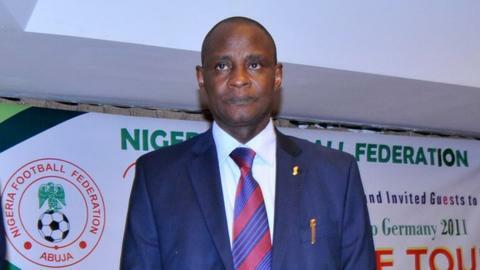 The Nigeria Football Federations (NFF) says Tuesday's elections will go ahead despite the arrest this week of some of its senior officials. Among those detained by the Department of State Services (DSS) was NFF president Aminu Maigari. However the DSS is yet to clarify why the officials were detained and if they were arrested or merely questioned. "Despite the problems, the NFF polls will go ahead as planned," an unnamed NFF board member told BBC Sport. Taiwo OgunjobiYola Abba AbdullahiMike UmehPinnick AmajuDominic IorfaShehu DikkoAmanze Uchegbulam. "Caf has confirmed Ghana FA chairman Kwesi Nyantakyi as its observer while a Fifa observer will also be in Nigeria for Tuesday's elections." Maigari was initially detained on Wednesday by the DSS on his return from a Fifa meeting in Switzerland. He was then questioned again on Thursday, along with senior board members Musa Amadu and Chris Green. Seven candidates have been cleared to stand in the elections to become president of the NFF at polls next Tuesday in Warri, Delta State. It is the third time that Maigari has been arrested in recent months, the first coming on his return from July's World Cup in Brazil. He was then held, along with Green and Amadu, on 26 August, again by the DSS in an incident which prevented a NFF general assembly from being held. If the planned elections on 30 September do not go ahead, then Nigeria will almost certainly be banned from global football until the next Fifa Congress in May 2015.